Free standing full round male body torso. Heavy duty plastic form is an ideal display for t-shirts, shirts, sportwear and more. Color: white. Weight: 3 lbs. Hanging full round male body torso with loop. Heavy duty plastic form is an ideal display for t-shirts, shirts, sportwear and more. Color: white. Weight: 3 lbs. Freestanding full round male body torso. Heavy duty plastic form is an ideal display for t-shirts, shirts, sportwear and more. Color: black. Weight: 5 lbs. Freestanding full round male body torso. Heavy duty plastic form is an ideal display for t-shirts, shirts, sportwear and more. Color: chocolate. Weight: 5 lbs. Full round male body torso with counter base, adjustable height from 35" up to 45"H. Heavy duty plastic form is an ideal display for t-shirts, shirts, sportwear and more. Color: black. Full round male body torso with counter base, adjustable height from 35" up to 45"H. Heavy duty plastic form is an ideal display for t-shirts, shirts, sportwear and more. Color: chocolate. Hollow back male body display torso with hook. Durable heavy duty plastic form is an ideal display for t-shirts, shirts, underwear. Colors: black, white, fleshtone, frosted clear. 33"H X 7"D X 19" shoulder to shoulder; men's sizes small to large. Hollow back male body torso with hook. Durable heavy duty plastic form is an ideal display for t-shirts, and more. Colors: fleshtone, black, white. 23.5"H x 19"W x 5"D.
Eye catching table top full round male body display torso. Muscular plastic form is an ideal display for t-shirts, underwear, and sportswear. Colors: fleshtone, white. Weight: 5 lbs. Full-round plastic male body display torso adjustable in height. Durable metal base. Adjustable in height from 48" up to 70". Colors: white, fleshtone. Hollow back display male body with adjustable height stand. Overall height adjusts from 20"H to 32"H. Colors: white, black. Plastic full-round male body display torso. Countetop style. Color: black. Hollow back display male body freestanding. Colors: black, white, clear. Hollow back male body display torso with hook. Durable heavy duty plastic form is an ideal display for t-shirts, shirts, underwear. Colors: black, white, fleshtone. 35"H X 7"D X 19" shoulder to shoulder; men's sizes small to large. Free standing full round male body torso. Heavy duty plastic form is an ideal display for t-shirts, shirts, sportwear, underwear. Color: white. Weight: 7 lbs. Hanging full round male body torso with loop. Heavy duty plastic form is an ideal display for t-shirts, shirts, sportwear and more. Color: white. Weight: 7 lbs. Full-round plastic male body display torso with adjustable floor metal base. Overall adjustable in height from 58" up to 72". Color: white. Full-round male body display torso with floor base. Adjustable height up to 72"H. Male display form is an ideal display for t-shirts, sportswear, sweaters. Color: matte white. 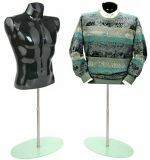 Size 40, Free standing full round male body torso with metal floor base. Made of clear heavy duty plastic. This form is an ideal display for t-shirts, shirts, sportwear and more. Color: clear. Weight: 20 lbs. Transparent full round male body torso with loop. Made of clear heavy duty plastic. This form is an ideal display for t-shirts, shirts, sportwear and more. Color: clear. Weight: 7 lbs. Full-round male body display torso with counter base. Overall height 45"H. Male display form is an ideal display for t-shirts, sportswear, sweaters. Color: glossy white. Full-round male body display torso with counter base. Adjustable height up to 53"H. Male display form is an ideal display for t-shirts, sportswear, sweaters. Color: matte white. Full-round male body display torso with counter base. Adjustable height up to 45"H. Male display form is an ideal display for t-shirts, sportswear, sweaters. Color: matte white. Full-round male body display torso with counter base. Adjustable height up to 45"H. Male display form is an ideal display for t-shirts, sportswear, sweaters. Color: matte gray. Full-round fiberglass male body display torso is a freestanding torso. Muscular body form is an ideal display for t-shirts, and sportswear. Color: glossy black. Full-round headless male body torso with counter base. Height with base 43"H. Male display form is an ideal display for t-shirts, sportswear, sweaters. Color: matte white. Full-round fiberglass male body display torso is a freestanding torso. Male display form comes complete with adjustable counter base. Color: glossy black. 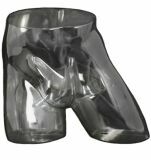 Made of durable plastic, adjustable height from 42" to 55"H. Full-round male body display torso is a freestanding torso. Male display form is an ideal display for t-shirts, tanks, sportswear. Color: white. Made of durable plastic, adjustable height from 42" to 55"H. Full-round male body display torso is a freestanding torso. Male display form is an ideal display for t-shirts, tanks, sportswear. Color: fleshtone. Made of durable plastic. Full-round male body display torso is a freestanding torso. Male display form is an ideal display for t-shirts, tanks, sportswear. Color: white. Made of durable plastic. Full-round male body display torso is a freestanding torso. Male display form is an ideal display for t-shirts, tanks, sportswear. Color: fleshtone. 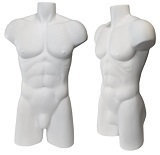 Made of durable plastic, adjustable height up to 44"H. Full-round male body display torso is a freestanding torso. Male display form is an ideal display for t-shirts, sportswear, tanks. Color: fleshtone. Freestanding full round underwear male buttocks form. 16"H; Hip - 37"; Waist - 30". Durable plastic form is an ideal display for underwear, undergarments, swimwear. Color: clear. Freestanding full round underwear male buttocks form. 16"H; Hip - 38"; Waist - 32". Durable plastic form is an ideal display for underwear, undergarments, swimwear. Color: glossy white. Freestanding full round underwear male buttocks form has attractive pose and realistic look. Durable fiberglass form is an ideal display for underwear, swimwear. 16"H; Hip - 38"; Waist - 32". Color: matte black. Freestanding full round underwear male buttocks form has attractive pose and realistic look. Durable fiberglass form is an ideal display for underwear, swimwear. 16"H; Hip - 38"; Waist - 32". Color: matte white. Freestanding full round underwear male buttocks form has attractive pose and realistic look. Durable fiberglass form is an ideal display for underwear, swimwear. 16"H; Hip - 38"; Waist - 32". Color: glossy black. Hollow back display male body with base with locking casters. Torso: 23"H x 19"W x 5"D, overall height 60". Durable heavy duty plastic form is an ideal display for t-shirts, and more. Color: white. Freestanding full round underwear male buttocks form. 15"H; Hip - 38"; Waist - 30". Durable plastic form is an ideal display for underwear, undergarments, swimwear. Color: clear. 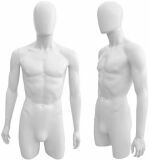 27"H full-round fiberglass male body display torso. Chest 40". Color: glossy black. 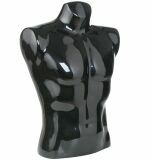 Full-round fiberglass male body display torso with counter glass base. Chest 40". Overall height adjustable from 39"H to 55"H. Color: glossy black. Full-round male body display torso is a freestanding torso. Male display form is an ideal display for t-shirts, sportswear, tanks. Color: gunmetal. Full-round male body display torso is a freestanding torso. Male display form is an ideal display for t-shirts, sportswear, tanks. Color: glossy white. Full-round male body display torso is a freestanding torso. Male display form is an ideal display for t-shirts, sportswear, tanks. Color: glossy black. Full-round male body display torso is a freestanding torso. Male display form is an ideal display for t-shirts, sportswear, tanks. Color: silver. 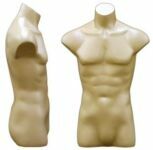 Full-round fiberglass male body display torso adjustable in height. Detachable arms & hands make them easy to dress. Durable metal base. Form can be used on counter top without base. Adjustable in height up to 60". Color: white. Full-round fiberglass male body display torso adjustable in height. Detachable arms & hands make them easy to dress. Durable floor base. Adjustable in height up to 70". Color: matte white. 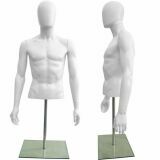 Full-round fiberglass male body display torso adjustable in height. Detachable arms & hands make them easy to dress. Durable floor base. Adjustable in height up to 70". Color: matte black. Full-round male torso comes with rolling metal base with brakes. Adjustable in height up to 60". Color: matte white. Full round display male legs body form, base. Elegant pose, fiberglass form is an ideal floor display for jeans, pants, undergarments, swimwear. Color: glossy white. 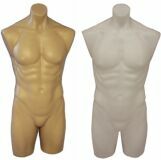 Full-round fiberglass male body display torso is a freestanding torso. Muscular body form is an ideal display for t-shirts, underwear, and sportswear. Colors: silver, fleshtone. Full-round fiberglass male body display torso adjustable in height. Detachable arms & hands make them easy to dress. Durable metal base. Form can be used on counter top without base. Adjustable in height up to 70". Color: fleshtone. Full-round fiberglass male body display torso is a freestanding torso. Muscular body form is an ideal display for t-shirts, underwear, and sportswear. Color: silver. Full-round fiberglass male body display torso is a freestanding torso. Muscular body form is an ideal display for t-shirts, underwear, and sportswear. Color: matte white. Freestanding full round underwear male buttocks form. Durable fiberglass form is an ideal display for underwear, undergarments, swimwear. Color: fleshtone. 17"H x 11"W; Hip - 35"; Waist - 30.5". Full-round fiberglass male body display torso is a freestanding torso. Muscular body form is an ideal display for t-shirts, underwear, and sportswear. Color: fleshtone. Freestanding full round underwear male buttocks form has attractive pose and realistic look. Durable fiberglass form is an ideal display for underwear, swimwear. 15"H; Hip - 38"; Waist - 32". Color: fleshtone. Freestanding full round underwear male buttocks form has attractive pose and realistic look. Durable fiberglass form is an ideal display for underwear, swimwear. 15"H; Hip - 38"; Waist - 32". Color: matte white. Freestanding full round underwear male buttocks form. 17.5"H; Hip - 39.5"; Waist - 32.5". Durable fiberglass form is an ideal display for underwear, undergarments, swimwear. Color: white. Freestanding full round underwear male buttocks form. 17.5"H; Hip - 39.5"; Waist - 32.5". Durable fiberglass form is an ideal display for underwear, undergarments, swimwear. Color: black. Freestanding full round underwear male buttocks form. 17.5"H; Hip - 39.5"; Waist - 32.5". Durable fiberglass form is an ideal display for underwear, undergarments, swimwear. Colors: fleshtone, silver. Full-round fiberglass male pants display legs are great for jeans, pants, underwear. Colors: fleshtone, white, black. Elegant male display form is made from metal wire. Form comes complete with adjustable floor base, overall height adjustable from 55" up to 65". Color: black. Elegant male display form is made from metal wire. Form comes complete with adjustable floor base, overall height adjustable from 55" up to 65". Color: white.